NM, India's premier Diagnostic and Health Checkup provider creates a unique experience that will become one of the memorable highlights of your visit to India. With a complete spectrum of diagnostic tests ranging from MRI and CT Scan to Mammography and DEXA Bone Densitometry, and a set of customized preventive health checkup packages designed to cater to different demographic and lifestyle profiles, NM is "THE DESTINATION" for a healthy and happy life. Over the past 25 years, NM has been a pioneer in the field of diagnostic imaging services in India. Additionally, NM has embraced the concept of 'Preventive Healthcare for you' in keeping with its tagline: Kyon Ki Musibat Kabhi Bolkar Nahi Aati! All of NM's health checkup packages are designed to offer you a holistic mind, body, and soul rejuvenating wellness experience. All the tests are conducted by professional, experienced doctors on the world's most advanced imaging equipments. In-between your tests, you can relax in First and Business Class lounges, browse the internet on personal laptops, avail of a soothing Meditation session with our in-house therapists, or indulge in our relaxing Medical Spa therapies, including the Hot Stones therapy, described as 'Heaven on Earth' by one of our guests. Meanwhile, your accompanying friends and family members can shop and dine at India's largest mall, and you can join them after your checkup, before returning to the centre for a post-consultation facility of your reports. After your reports have been discussed, you can be guided for the required treatment options if you wish. You may subsequently follow up with a doctor via email from your home country. NM currently caters to international travellers from the Middle East, Africa, United Kingdom and USA, who find the world class services extremely economical compared to those offered at similar centres abroad. 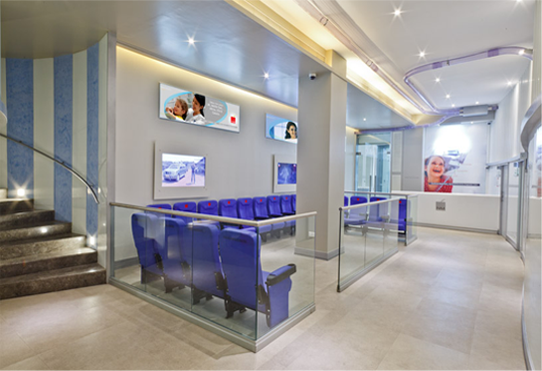 The unique factors that make NM special are the non-hospital environment created for health checkup clients, and its location in India's largest mall. Now, you need not go to a hospital for a preventive checkup and expose yourself to sick patients, or move up and down various floors to access various test departments. Additionally, after your checkup is complete, take advantage of Mulund location by shopping in India's largest mall. Enjoy a wonderful lunch at Mumbai's premier Gujarati and Continental restaurants, or at Sachin Tendulkar's exclusive cafe in Mulund. Catch the latest Bollywood movie at the nine screen multiplex dome. And after you have explored the variety of entertainment options at the mall, come back to NM for a post consultation facility of your reports. "This is the most beautifully maintained and warm centre I have ever been to. Thank you so much for your warmth and hospitality." - Dia Mirza, Bollywood actress.